Abdominal Cuts - Diet Pill Reviews: Does Abdominal Cuts Really Work? 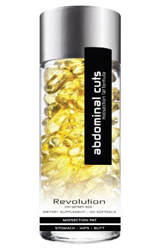 Abdominal Cuts is a weight loss supplement that makes some rather unique claims – to specifically trim the fat from challenging areas like the abdomen, hips and thighs. The product also promises to reduce sugar cravings and enhance lean tissue throughout the body. The really unique factor about Abdominal Cuts is that it claims to do all of these things without the use of any sort of stimulant in the formula. Instead, the product utilizes a proprietary blend of naturally-occurring health oils to work their fat burning magic. The ingredients in Abdominal Cuts include conjugated linoleic acid, gamma linoleic acid (GLA), alpha linoleic acid (ALA), eicosapentaenoic acid (EPA), DHA, sesamin and vitamin E.
Conjugated linoleic acid, also known as CLA, has been shown in initial studies to have a positive impact on weight loss. It has also been shown in preliminary studies to enhance lean muscle mass in some subjects. The question would be whether there is a sufficient amount of CLA in Abdominal Cuts to produce the desired effect. However, with proprietary blends, it is difficult to know how much of each individual ingredient is included in the mix, making it difficult to ascertain the effectiveness of the product. GLA and ALA are both indeed healthy oils that offer many benefits to the body. GLA is often derived from evening primrose oil and has been shown effective in treating inflammation. Initial reports indicate it might be beneficial in fat burning as well. ALA is an omega-6 fatty acid that may lower blood pressure and cholesterol. EPA and DHA are the substances found in fish oil, which offers a host of healthy benefits. Sesamin is found in many nutritious foods like fruits, vegetables and flaxseed. This ingredient may lower blood pressure in some users. While these ingredients are all good for the body, their impact on weight loss is still in the initial research phase. The fact that this is a proprietary blend means that we cannot accurately ascertain just how much of each substance is in the mix to determine the effectiveness of the product overall.